Hungary is a landlocked country located in Central Europe, bordered by Austria, Slovakia, Ukraine, Romania, Serbia, Croatia and Slovenia. The capital is Budapest, a Danube city. Hungarians speak a language and form a culture unlike any other in the region: this distinctiveness has been both a source of pride and an obstacle for more than 1100 years. where one of the most famous wines originates: the Tokaj wine. Rapid industrialization in Hungary contributed significantly to a number of major environmental problems, including air, water, and soil pollution. Despite improvements following economic and political changes, air quality is still a concern. Emissions from automobiles and electric power plants are the main contributors. A significant percentage of the country’s forests, waterways, and buildings suffer damage from acid rain, caused by sulfur dioxide in the air. Winds carry Hungary’s polluted air into neighboring countries, where it has caused similar problems. River, lake, and groundwater pollution in Hungary are the result of industrial runoff, part of which untreated when it enters the water. Insufficiently treated sewage also contributes to water pollution, as not all of the country’s population has access to adequate sanitation facilities. Hungary’s Lake Balaton, the largest lake in central Europe, is also polluted. 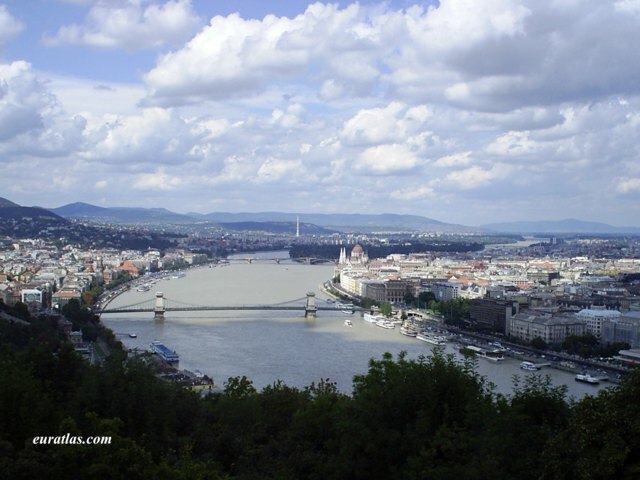 Because Hungary shares its major waterway, the Danube, with other European countries, pollution problems affecting neighboring countries often affect Hungary as well, and vice versa. Industrial areas are characterised by heavy metal and hydrocarbon contamination of groundwater, especially where mining activities destroy protecting layers. On the other hand, due to improvements in drinking water supplies, the number of settlements having undrinkable water has been significantly reduced. Soils are also susceptible to pollution from chemical runoff from local industries. Agriculture activities, the use of fertilisers or liquid manure, the application of herbicides and pesticides, exert an important influence on soil and water quality. However, in the past years agricultural production has taken on a more extensive, and at the same time, less environmentally polluting character. Only a part of communal landfills meet the environmental standards to varying degrees. The amount of municipal solid waste has increased, a great part of which is discharged in an uncontrolled manner. However, the total amount of hazardous waste generated in Hungary has decreased. Reforestation efforts have allowed the country to steadily gain forestland (currently standing at about 20%). About 9.3% of Hungary’s land is protected in parks and other reserves.As of 2001, 8 of Hungary's mammal species and 10 of its bird species were endangered. Eight plant species were also endangered. Endangered species included the longicorn, the alcon large blue butterfly, the dusky large blue butterfly, and the Mediterranean mouflon. Despite having a naturally variable climate, temperature increases have been clearly seen in Hungary over the last 30 years. This warming is occurring unequally, with temperature increases being stronger in the eastern and north-western territories. Hungary has also seen a significant decrease in precipitation in the 20th century. Unfortunately, “the decreased amount of precipitations falls in a more intensive pattern which decreases the potential utilization of the water and increases the run-off, which is increasing to the risk of floods.” In other words, climate change means Hungary must deal with less rain and more floods. At the moment in Hungary the culture of participatory democracy is still not widely accepted after the communist regime. Central government plays a very important role in influencing regional policies. Issues like not letting citizens to participate and citizens not wanting to participate in regional development activities are “Hungarian characteristics” – resulting from (and still left behind by) the 40 years of dictatorship. External facilitators or advisers on how to integrate sustainability practices in regional development come from different backgrounds in Hungary (NGOs, research and educational institutions, private consultants) and have different understanding of local sustainability and different ways to proceed. This is why only a very limited numbers of “real processes” (really activating local people for dialogue and common action) are going on. According to OECD there are about 21 environmental taxes in Hungary, among which 4 regard fuel and vehicles, 2 regard air pollution, 4 regard water, 9 regard waste, while the remaining 2 refer to noise and soil pollution. There are also 4 environmentally motivated subsidies with the purpose of: reusing of increasing the energy efficiency of buildings from the revenues coming from the transfer of Kyoto units; reducing the emission of greenhouse gases, climate change mitigation, raise awareness and giving financial assistance to elderly people, large families and disadvantaged people; controlling pollution by providing economic incentives for achieving reductions in the emissions of pollutants; stimulating sustainable development through technology transfer and investment. Environmental taxes represented 2.6 % of GDP. This share is equal to the EU average and has remained roughly stable between 2003 and 2009. Taxes on energy account for the largest part of environmental tax revenues. Nearly two thirds of the Hungarian companies support the non-profit organisation in some way, but their donations are motivated by almost the same solidarity considerations as those of the private individuals. Though the concept of corporate social responsibility is gaining ground, it is put into practice almost exclusively in the form of traditional charity. It has not become generally accepted, yet, that private companies as stakeholders also have an interest in promoting local development and solving social problems in co-operation with civil organisations.